Diamonds come in many shapes and sizes. After they are sourced from their rawest form and sold into the world for purchase, they have to go through some processes by skilled diamond cutters. These gems are then carved into many desirable diamond shapes and come in many different sizes. Normally you would think the larger the diamond the more expensive it should be, but there a few things to consider when you finally decide on the design and size to go for. Read the four C’s, to understand more about the pricing of diamonds. So what diamond shapes do you have in mind for your Engagement Ring purchase? and which one is your favourite shape? To achieve the results needed for a perfect round diamond, its has to have 58 facet cuts and divided among its crown, girdle and pavilion. The crown is the top of the diamond, the girdle is the widest part of the diamond and the pavilion is the base. The main aim is to achieve a final diamond that has maximum fire and overall perfection. The Round brilliant diamond is the most popular of diamond cuts and sells more than 80% compared to its brothers and sisters shapes. The oval shaped diamond relies on having perfect balance and symmetry. This really is a truly elegant diamond to look at. This is suited for the smaller lady hand as it adds length to fingers. 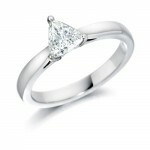 The Oval diamond is also renowned for the way it reflects light and sparkles with every hand movement. The marquise diamond is shaped like a rugby ball or a pointed chocolate. The facets have to be cut with precision in order for the stone to have that brilliant sparkle. Failure to do this correctly will result in dark areas across the finished diamond. This is a beautiful shape and works well with smaller diamonds surrounding it. An elegant shaped diamond that looks like a tear or rain drop. These wonderful gems work well with both earrings and necklaces. The pear drop ring set also looks entertaining and modern. This diamond shape can also be more suited for the smaller hand as it has that elongated effect. Love and romance define the shape of the heart diamond. A very popular shape for such occasions like Valentines day and wedding anniversary’s. The cutter really has to have dedicated skill and time to create each heart shaped diamond. The cutting process also has to give the diamond a strong outline and an even shape to finish. This has to be one of Jewellery Monthly favourites. Here we have a fine example of the Crisscut Cushion by Diamond Queensland. A popular choice for someone that is looking for something different and unique. This royal blue stone example sits nicely on this diamond shoulder shank. This is a rectangular shape with cut corners. It is known as a step cut because its flat planes resemble stair steps. The flat planes of the outside edges allow for a variety of side stones shapes. The Princess Cut has rapidly become one of the most hot fancy shaped diamonds, due to its very seductive shape. Many people like the Princess diamond because it is square or rectangular and defines a different taste, compared to that of the Round Brilliant Cut. The proportions of each stone is considered with exact 90 degree internal angles on each corner. The Trilliant Cut diamond is the Egyptian pyramids of the diamond world. The fiery brilliance of this cut makes Trilliant Cut diamonds a uniquely beautiful centre diamond or two can serve as wonderful side stones, they can also fit alongside other cuts, such as the Emerald or Princess diamonds. The Trilliant cut normally has 25 facets on the crown, 19 facets on the pavilion, and a polished girdle. It is also preferred that the angles of this triangular stone be equal as this will retain a higher value. The radiant cut is a relatively recent invention, this square or rectangular cut combines the quality of the emerald shape diamond with the brilliance of the round The original radiant cut had 61 facets, excluding eight girdle facets. The ideal proportions of a radiant cut diamond are generally considered to be when the length of the diamond is about 1½ times greater than its width. Cushion cut diamonds, also named as the “pillow-cut” diamond. The cushion-cut is an antique style of cut, and it is known for having a deep cut with large facets. These large facets are what bring out the sparkle and brilliance when the diamond is exposed to light. 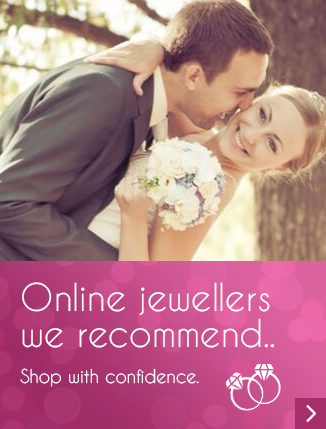 Many other diamond shapes, cuts and stone sizes are available in the jewellery market today. Many people are looking for something unique. Fashion plays another role in hot diamond trends, also celebrities are showing off new and iconic designs. Other designs to look out for are the kite, triangle, flower and natural crystal formations. Hi Eric thanks for your suggestion. Asscher cuts are beautiful stones. I think Marquise stones always look amazing in mounts but they seem to be less popular purchases. Why do you think this is? 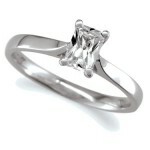 I like princess cut diamond. It is looking very nice. As beautiful as all the different cuts are I will always favour the round brilliant cut, a true classic, I love it so much I picked 3 for my engagement ring!